Okay, it's a one-trick pony, but it does that trick very well indeed; expensive it may be, but there's no denying the Armstrong's charms. Great, punchy sound. Solidly built. The 'Shock Guy' logo is a big clue as to whose signature guitar this is! Green Day's Billie Joe Armstrong has always been a great songwriter, but it wasn't until 2004's American Idiot album that he became a bona fide rock 'n' roll icon. His main instrument soon acquired star status too - a 1956 Gibson Les Paul Junior affectionately reffered to as 'Floyd'. Never one to miss a marketing opportunity, Gibson soon suggested a signature axe based on Floyd. Two years on, the Billie Joe Armstrong Les Paul Junior arrived. When Gibson introduced the Junior in 1954, the basic concept was to sell a simple and cheap variation of the Les Paul to the student market. Back then the Junior retailed for just $99. Half a century later, it's ballooned to a grand and a half. So yes, this is a big investment (especially when you consider that the Epiphone Juniors start at £139) for a 'simple' electric, but it still costs less than the Custom Shop '57 and '58 reissues that are currently the only Gibson-made alternatives. Back in 2004, Armstrong said that if he did endorse a guitar, "it would be simple - one pickup, no switches, just one thing where you could crank it and it would be loud." And we're pleased to say that he's been true to his word. Although Gibson launched double cutaway Juniors in 1958, the Green Day man reckons they "don't sound as good as the single cutaway" and has plumped for the original as the base of his signature model. The body couldn't be simpler; a slice of mahogany that looks like a Les Paul on the Atkins Diet. No contours. No maple caps. No embellishments. Nothing to interrupt the virginal white surface bar a black pickguard and master volume/tone pots. Whether this is minimalist or just plain boring, it's totally your call. If you have ever seen Armstrong up close, you'll understand why he's strayed from the blueprint when it comes to the Junior's set mahogany neck. "This guitar is pretty much like Floyd," he points out on the Gibson website, "apart from the neck. This is more of a '60s neck so it's easier to play and get your hands around, whereas the '50s necks were a bit thicker." The Billie Joe Junior is available in three different finishes and it's a more important decision than you might think. Here on our Classic White Junior you get an ebony fingerboard (both the Vintage Sunburst and Ebony versions use the more run-of-the-mill rosewood). At the same time there is the slight drawback that we're lumbered with black volume pots (the others have cooler amber control knobs). 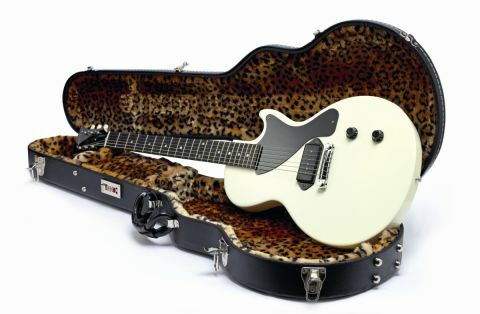 Ultimately, whichever finish you choose you get the same nickel hardware (like the original Juniors, the hardware consists of a wraparound bridge and white-buttoned tuners) and a cool leopardskin-lined hard case. As is signature model protocol, Armstrong has scrawled his signature on the back of the headstock, which is the only obvious Day reference point. So it's good for non-Green Day fans, too. So far, so 1950s. It's not until you check out the Junior's solitary pickup in the bridge position that you're dragged kicking and screaming into the noughties. It might look exactly like the 'dog-ear' P-90s that featured on the first Junior guitars, but the spec sheet reveals this is actually Gibson's stacked double-coil H-90, designed to iron out all the interference that was the achilles heel of the original model. "It's kinda based on the P-90," confirms Armstrong, "but it's hum-cancelling, so you can play it onstage and crank it with lots of distortion. You just get to hear what the guitar sounds like." As anyone from The Clash's Mick Jones to Dirty Pretty Things' Carl Bârat will tell you, Les Paul Juniors aren't meant to look pristine. This guitar is a staple of punk-rock and should be played in sweaty basements and carried home in a binliner. The good news is that whether you choose to chip a bit of paint off the Billie Joe Junior for authenticity or stick with its immaculate US finish, we don't see any structural problems in the pipeline. For one thing, the neck is set too deep into the body (it hits at the 16th fret) to warp or snap under normal playing conditions. And for another, the bridge configuration is too simplistic to go wrong. The only potential deathtrap we can envisage is the combination of the angled headstock and the tiny strap nubbins (we were using a fairly standard strap and the guitar fell off a couple of times during our review). So avoid tears by investing in a couple of strap locks. That said, at least the Junior is one of the lighter members of the Gibson family, especially when compared to its Les Paul sibling. We played it for two hours without taking a break and you should be able to make it through a proper gig without buggering up your spinal column. Besides which, the Billie Joe Junior is comfortable where it counts - up and down the length of its neck and fingerboard. The slim-taper '60s profile neck combines superbly with a narrower than standard nut profile (1.687") and a gorgeous fretboard to make fast runs really easy. Thanks to a standard Gibson 24" scale length, bending, squeezing and adding vibrato to the Junior's strings also feels natural and allows for more than Armstrong's trademark powerchords. OK, so the Les Paul Junior has never been a shred machine, but it plays fast enough to be used by the likes of Billy Corgan and Gary Moore, so you shouldn't have any problems. When it comes to tone, the Gibson Les Paul Junior has always enjoyed a reputation as an uncomplicated rock 'n' roll workhorse, best played through a high-gain valve amp. In our experience these guitars sound crunchy, brittle and rasping; the kind of tone that Libertines fans would kill for and Eric Clapton would run a mile from. Armstrong has his own description: "The sound I go for is that real punchy mid-range kinda sound," he explains. "The first time I picked up a Junior, which was the guitar I now call Floyd, I plugged it in and it was the sound I'd heard in my head for so many years. They just have a real rock 'n' roll sound. You can really hear the sound of the wood." Upon cranking the Billie Joe Junior through a Marshall (the frontman's amp of choice), that explanation makes a lot more sense. When you dial up a mild distortion there's an organic sound to this guitar that seems to bypass the H-90 pickup and give you the unadulterated tone of the mahogany body and neck instead. Push the gain dial a little harder, meanwhile, and you will bring in the ragged quality that Junior nuts have always raved about. Granted it's not a smooth or subtle tone, doesn't get close to the sustain of the full-size Les Paul and wouldn't be much use to anyone interested in starting up an Allman Brothers tribute band. But for a gig in a sweatbox venue, or slicing through a murky mixing board, you won't find anything better. Let's not pop the champagne quite yet, though. As we feared, the Billie Joe Junior is not a particularly versatile guitar. The tone control tries its best to add diversity (and a decent amp helps in this respect), but the lack of a neck pickup inevitably means that you will find other axes 'fill the room' more convincingly. And with surprisingly few tips of the hat to the Green Day frontman your audience might not even realise that you're rocking a signature model. To the naked eye, it's a textbook Les Paul Junior. Very cool, of course, but hardly the stuff of revolution. Still, this as an instrument rather than a fashion accessory. And, although expensive, for tone, build and comfort that you'd have to be a basket case not to appreciate it.